I awoke at dawn with the excitement of a child, and kept peeking anxiously out the window as I got dressed to see if the jeep had arrived. I was at Ranthambhore National Park, India’s premiere tiger reserve, getting ready to go on a tiger safari, with high hopes of seeing my first-ever tiger in the wild. Part of my excitement stemmed from genuine curiosity about and admiration for these magnificent creatures, but another part of it stemmed from a sense of eco-conscious urgency. A year earlier in India, I had seen the ominous billboards featuring a solid black background with a photo of a tiger and the haunting words, “Only 1,411 left.” In fact, the tiger is one of the world’s most endangered species: 3 out of 9 species have already been wiped out, and only about 3,200 tigers remain worldwide. The more research I did, the more alarmed I became about the future of tigers in India (and elsewhere), and the more determined I was to experience the thrill of seeing this big cat in its natural habitat. So I planned part of my 2011 trip to India around visiting Ranthambhore, and happened to be in Delhi for the Global Tiger Initiative‘s International Tiger Summit. The event drew journalists, wildlife conservationists and environmentalists from tiger-range countries all around the world, all of us packed into a sardine-tight room that immediately made me wonder how much of a priority tiger preservation is to India’s politicos. To be fair, the Indian government has a LOT of pressing problems to attend to. But, as custodians of 60% of the world’s tigers, they also have an important responsibility to ensure the nation’s most widely revered wildlife species. The big news at the International Tiger Summit was the announcement of the 2010 tiger estimate (which only happens every four years), and the news was good: The tiger population in India had increased by 12%, from 1,411 to 1,706. 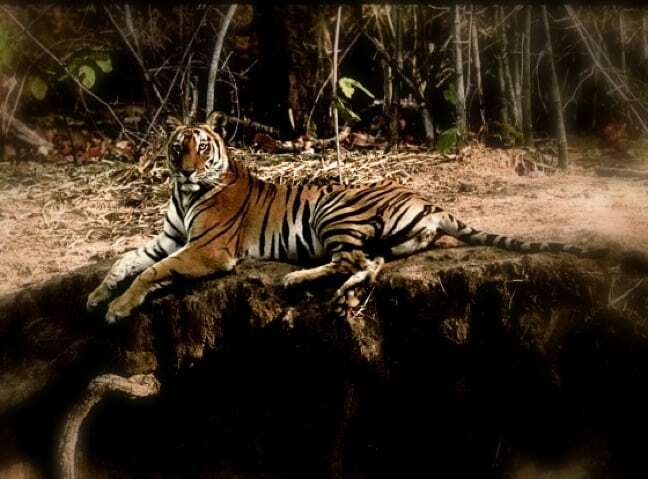 However, this statistic was mitigated by three important factors: 1) a percentage of this increase is due to improved assessment methodology; 2) tiger habitat, especially corridors between protected areas, decreased from 93,000 to 72,800 square kilometers in the four years since the previous estimate; and 3) most of the tiger population’s growth was in areas around India’s 39 protected tiger reserves, in multiple-use forests where the likelihood of human-tiger encounters is high. The future does not look good for tigers in India because many of the tiger reserves are already at maximum capacity, and tigers (who need a lot of territory in which to hunt and breed) have no room to expand. This is problematic for many reasons, not the least of which is the threat tigers roaming in search of territory pose to people who live near the reserves. This was the story that the journalists jumped on. There is tremendous competition for land in India, a country with a rapidly growing population of 1.2 billion. 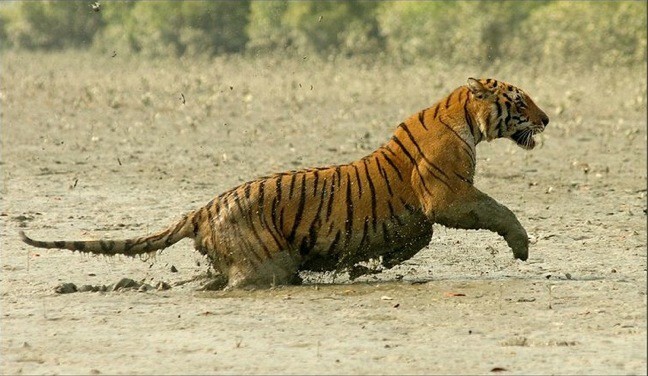 And, unfortunately, tigers don’t get to vote. It’s a complicated situation, but for a very good summary read The Failing Fight To Save India’s Tigers. TIGER TOURISM: FRIEND OR FOE? Shortly after attending the Tiger Summit, I headed to Sawai Madhopur, the town closest to Ranthambhore. Before visiting the park, I interviewed Dr. Dharmendra Khandal, a conservation biologist with Tiger Watch, an independent organization founded by legendary tiger protector Fateh Singh Rathore. Dr. Khandal is gaining a reputation that may equal or surpass Rathore’s: National Geographic Adventure has profiled the scientist’s dangerous quest to vanquish the poachers and wildlife smuggling rings that operate in Ranthambhore. Dr. Khandal walked me through a slide show that demonstrated the need for safe tiger corridors between Ranthambhore and nearby wildlife sanctuaries, such as Sariska. He also pointed out that the disappearing forests are threatening many other Indian species of flora and fauna. The tiger draws a lot of attention, but the leopard, Asian elephant, Asiatic black bear and greater one-horned rhinoceros are also endangered. India has put a lot of effort (and money) into promoting tiger tourism, and many luxury chains have opened resorts in and around tiger reserves. Knowing that the Ranthambhore area has far more hotel rooms than it does spaces for tourists in the restricted number of seats in gypsies (a.k.a. jeeps) and canters allowed into the park, I asked Dr. Khandal his opinion on whether ecotourism benefits the tigers’ cause. “I’m pro-tourism,” he said, “because it supports the local economy and it helped create a lobby for tigers. It’s only a menace if badly managed.” However, there has not yet been a study conducted on the effects of tourism on tigers, so it’s hard to tell whether it’s helping or hindering the tiger’s survival. 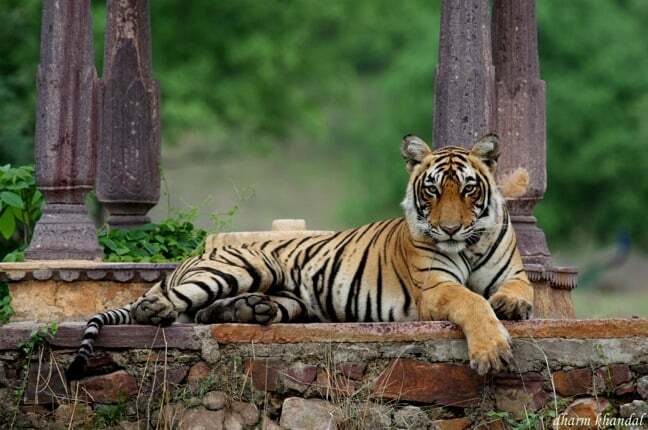 On Tigernet, the website for the National Tiger Conservation Authority, Dr Khandal said that he believes hotels and lodges can exist amicably with wildlife if handled properly, and he cited the Khem Villas outside Ranthambhore as a superb example. After touring Khem Villas, it did seem to be beautifully designed to allow animals to roam the property, while simultaneously preserving the comfort and safety of guests. 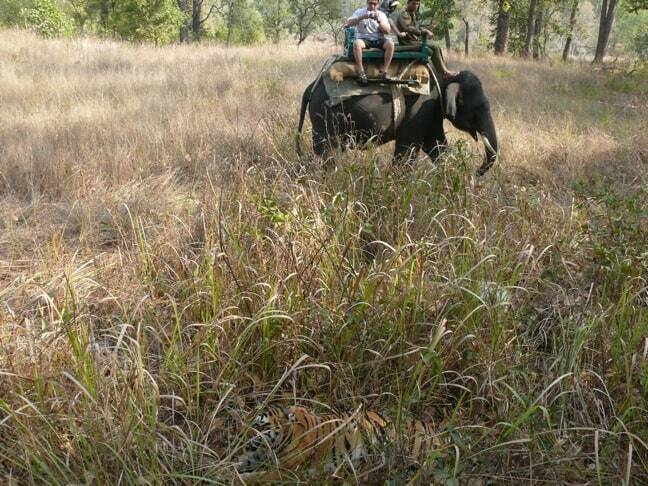 My tiger safari was scheduled for the morning after my interview with Dr. Khandal and my tour of Khem Villas. When the jeep pulled into the Farm Villas (the small, rural hotel where I was staying in) shortly after dawn, I literally ran out of my room and jumped in, camera in hand. There was a still a refreshing chill in the air, but the sun was up by the time we arrived at the park. We were assigned to our zone, and away we went– four eager tiger tourists and three guides (including the driver). All morning we zig-zagged around the park, a dry deciduous forest with excellent sight lines. And though we saw spotted deer, monkeys, sambars, a massive crocodile and all kinds of beautiful exotic birds, in the end I did not see a tiger during my day at Ranthambhore.